Jupy Plays: Stranger of Sword City! 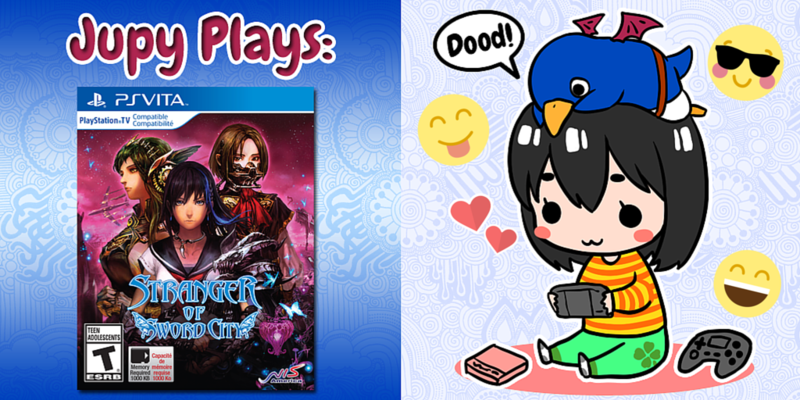 | NIS America, Inc.
Home / Blog / Jupy Plays: Stranger of Sword City! Hi there! It’s me, Jupy! I’m here today to give everyone my thoughts about the freshly-released Stranger of Sword City, available now on the PS Vita and on Steam in June! While I do play many RPGs, DRPGs are something I am fairly new to. With unique elements like making your party from scratch to ambushing monsters for rare loot, Stranger is definitely a game I was very excited to play. Character creation was very fun and took the most time, mainly because I wanted to create a well-balanced team. 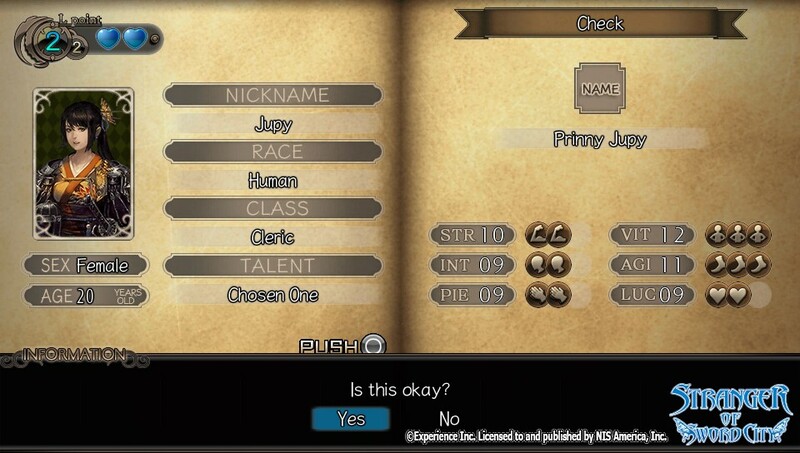 Although Stranger does not let you customize character appearances (the portraits are preset), you can customize everything else including gender, race, class and age. So yes, that means a seemingly muscular, bearded dwarf can be a female! Also, each category affects your base stats, so choose carefully! Age is the fun part and very unique to this game. How does that work? Well, the older you are, the more bonus stat points you receive when gaining experience, but the tradeoff is less life points (e.g. less lives). The opposite runs true for younger characters, so I tended to lean towards characters in their 20s and 30s (yes, even the old bearded wizard was only 32). Despite my balanced team, I thought it would've been pretty hilarious to create a team of 10-year-olds (that's the youngest age available) despite the portraits showcasing dwarves, wizards and samurais all past their prime but... looks can always be deceiving! Aren't I right, dood? These are my colleagues-- er, party members! From left to right are Jupy (that’s me! ), Jordan, Robbie, Chris, Dark Knight and Bossman. Although the game doesn’t go easy on beginners, as long as you strategize, you could battle your way through monster-filled dungeons without too much trouble. Of course, you can choose a whole squad of Knights, or a team of Wizards, or even a team of Samurai! Some enjoy creating a glass cannon party and charging forward, but Potions can only take you so far, dood! That's why I suggest having at least a Cleric or two in your team to ensure you are always healed up for the battles ahead. Another cool and unique aspect of this game was the “Ambush” system, where you challenge a monster guarding a chest of loot. 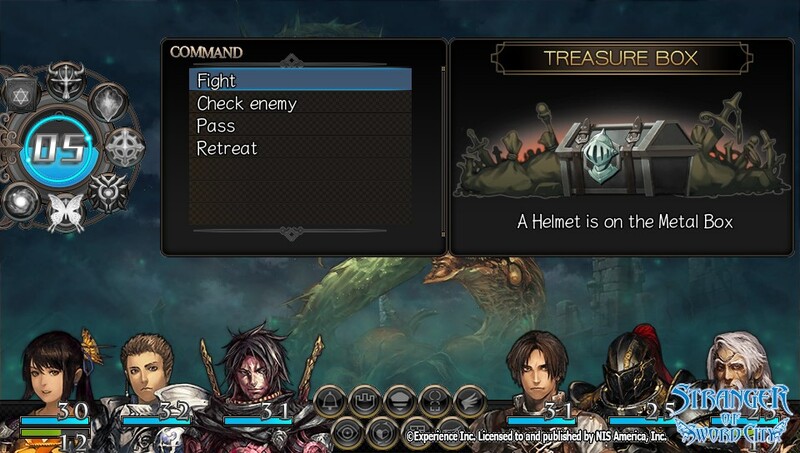 It’s a gamble when you have to decide whether the treasure chest is worth fighting a tough monster for, and if you decided to pass for a stronger monster and better loot, you could get ambushed yourself! But are the payoffs worth the battles? I’d say yes! 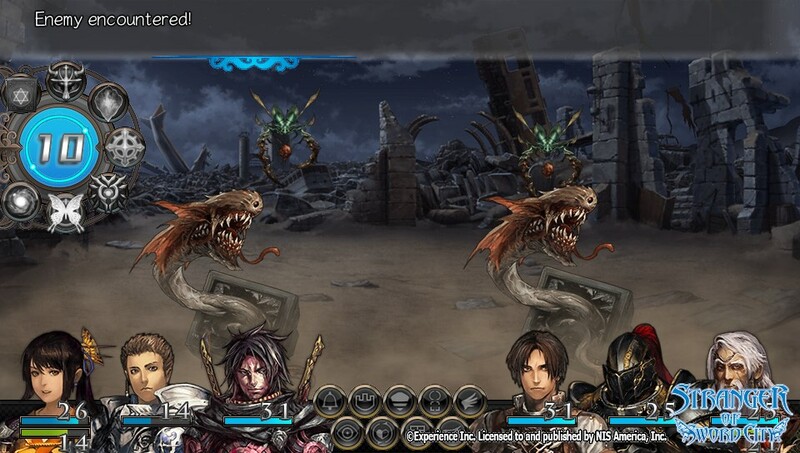 After some hands-on experience, I’d say Stranger of Sword City is a title you can’t miss. If you want to know more about it, check out the official website. It’s on both the PS Vita now and will arrive on Steam in June, so there’s no reason why you shouldn’t give it a shot!